This tutorial is for Ultrafractal 5 and the use of the Mesh Raytracing ucl in reb5.ucl with the primary code files in reb.ulb. Major revisions have been made to the mesh raytracer so the artist will need to download the most recent version from the Ultrafractal formula database to use this tutorial. 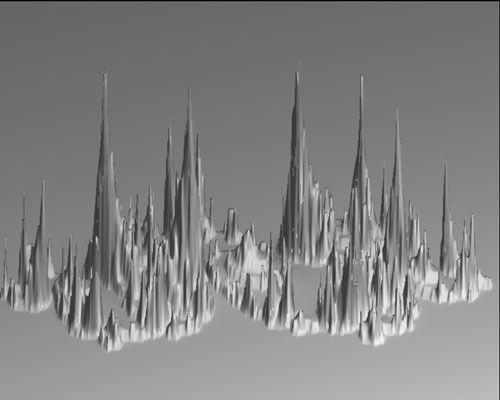 Height values based upon cabs(z), distance estimate, exponential smoothing, general smoothing, iteration, orbit traps, potential, and Vepstas/Härkönen smoothing. 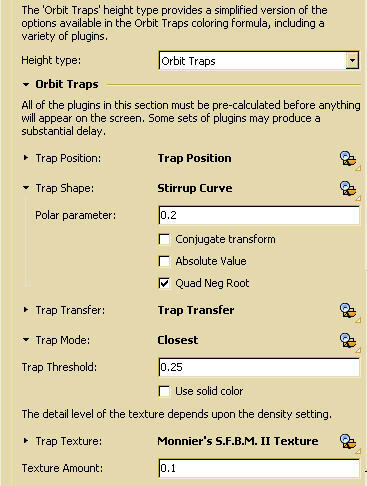 The orbit traps are a subset of the options in Damien Jones' Orbit Traps and can use most of the same plugins. Raytracing is a process to provide realistic lighting, perspective and hidden surface removal effects to a scene. A raytracer includes includes a camera (or eye) and one or more light sources. The raytrace process can be envisioned as the shooting of rays from the camera to the objects in the scene. The raytracer uses the distance to the intersection point, the surface normal at the intersection point, and the angle and intensity of the light source(s) to determine the coloring at the intersection point. Precise mathematical formulas exist for calculating these parameters for regular solids such as spheres, planes, cubes, etc. To deal with a general curved surface, the surface is often approximated by a mesh of triangles, which is what is done with the mesh raytracer. Precise equations are available for calculating the intersection points, normals, etc for ray-triangle intersections. The triangle approach has the limitation that it doesn't produce a smooth surface. 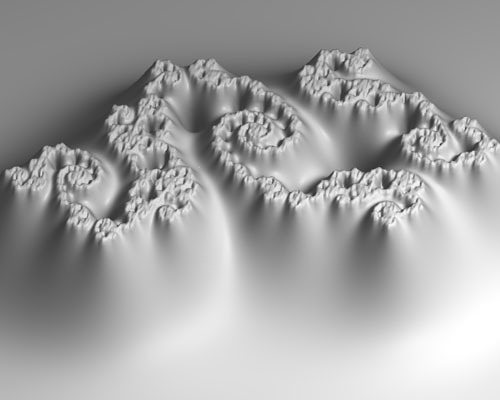 The image below shows a fractal surface simulated with a triangle mesh using exponential smoothing for calculation of the height values. As you can see, it has a chunky, blocky appearance, and the triangles are clearly visible. With Phong shading the following is done. Each point or vertex within the mesh is shared by six triangles (except for the edges). An average normal is calculated for each vertex, which is the average of the normals of the six triangles. When a ray intersects one of the triangles in the mesh, the value of the normal at the intersection point would normally be the normal of the triangle. With Phong shading a different value is used. It is the interpolated normal from the average normals at the three vertices of the triangle. Phong shading also has an additional factor called specular lighting, which simulates the shiny spots that are seen on smooth surfaces. 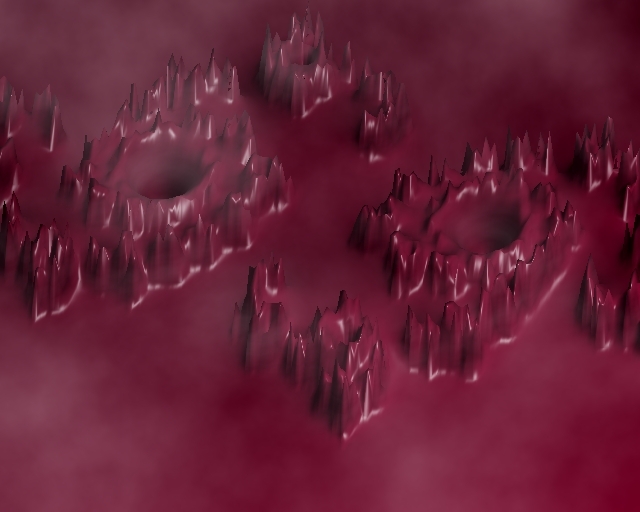 The next image shows the same surface displayed with Phong shading. 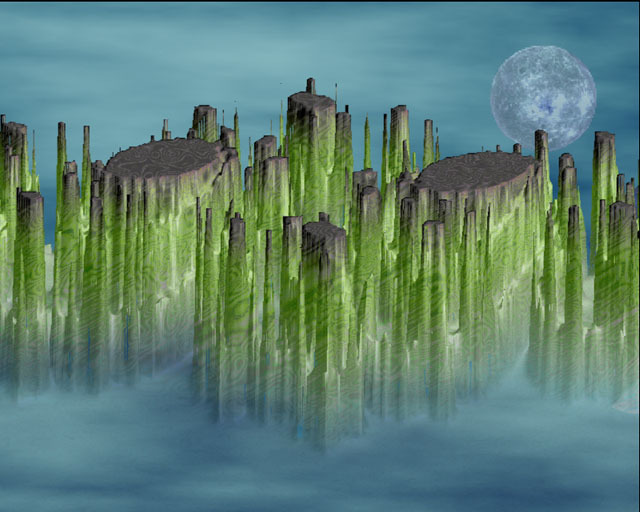 Both of these images were created with a relatively low mesh density of 0.2. A density of 1.0 would provide 1:1 mapping of the screen pixels to triangles. 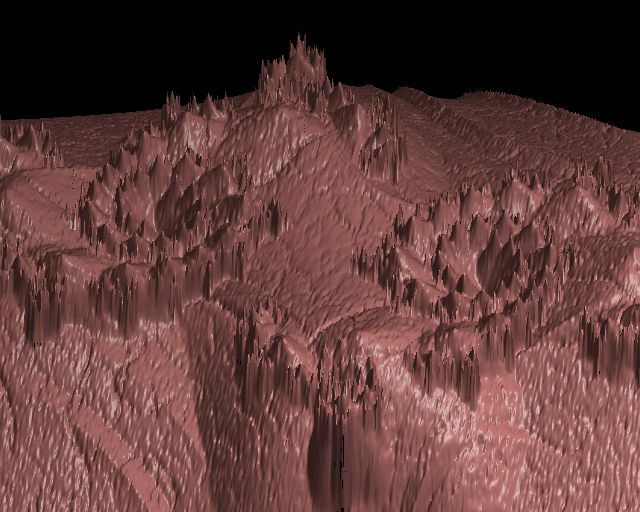 Greater detail can be obtained with higher densities, but with considerably slower rendering and requires considerable more computer memory. Ultrafractal 5 has a memory limit of 2GB. With a mesh density of 1.0 this limits the image size for a single layer to 850 x 850 or its equivalent for rectangular sized images. It's important for the artist to select the lowest possible density that provides the artistic effects desired. To use the mesh raytracer, select one of the pixel formulas from the Formula tab in UF5. DO NOT USE ANY OTHER TYPE OF FORMULA! On the Outside tab in UF5 select reb5.ucl and open the Mesh Raytracing formula. The most recent version of the mesh raytracer is not backwards compatible with earlier versions. If you have an older version please update the formulas. 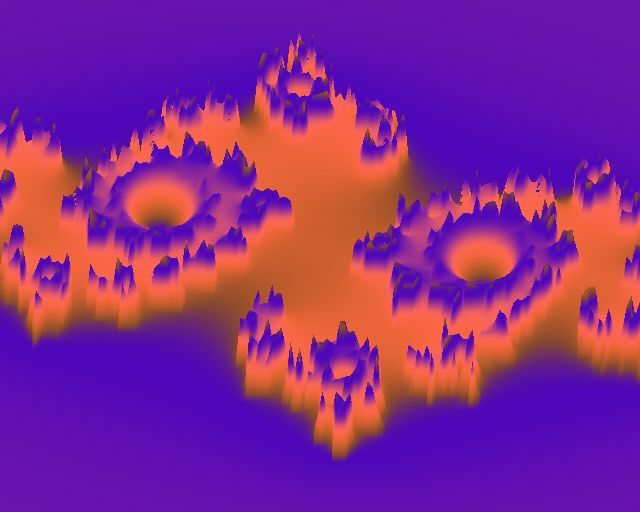 With the default settings the user will see a Mandelbrot fractal that uses the distance estimate height type for a Phong shaded height field. In the default diffuse lighting mode the raytracer selects the color at the mid-point of the gradient and uses that color for all the shading. Bring up the gradient editor and change the gradient using the F5 key to see the effect on your image. If the gradient mid-point happens to be a fairly dark color, the specular highlights will be especially pronounced. Here is a upr and image to illustrate. The distance coloring mode colors by the distance from the camera to the triangle intersection using raw triangles. The Z value coloring mode uses the unrotated height value and an algorithm similar to Phong shading called Gouraud shading. The color value used at the intersection point in the triangle is the interpolated value from the color values at each of the triangle vertices. The next two uprs and images illustrate these coloring modes. Both Distance and Z Value coloring modes can be used in layers to merge with the diffuse lighting layer to create interesting effects. Some of the images in the Height Field Gallery were created this way. 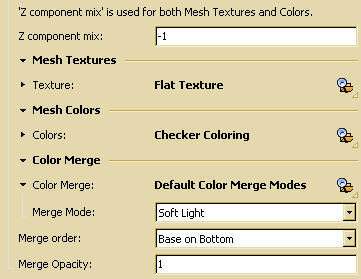 At the bottom of the parameters list are slots for texture and coloring plugins. The next example will illustrate the use of a texture plugin, using Damien Jones' fBm plugin. 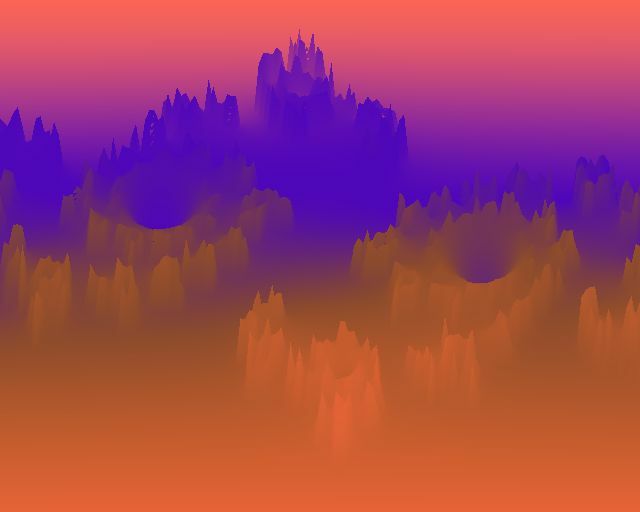 The plugin makes the image look like a fog or mist has rolled in over the fractal. The Colors plugin includes a wide variety of options, including image import. In the following example the Checkers Coloring plugin is used because it illustrates the functionality 'Z component mix' parameter in a clear manner. When textures and colors are applied they usually have a more aesthetically pleasing appearance when they vary with the height value. The 'Z component mix' parameter provides this functionality, and how it works can be clearly seen with the checker pattern. The parameter snapshot also illustrates how the coloring for any of the Colors plugins are managed. The coloring is merged with the mesh using merge modes everyone should be familiar with. The merging can be done with the coloring on the top or on the bottom, and with any opacity setting. The mesh itself is the base. A sample upr and image are below. The artist should try varying the value of the Z component mix parameter to see its effect, and also vary the merge modes, merge order and opacity. One of the more interesting height value options is the use of an orbit trap to determine the heightfield. The parameter snapshot below should look familiar to anyone who has used the Orbit Traps ucl for UF5. All of the plugins in this section must be pre-calculated before anything will appear on the screen. Some sets of plugins may produce a substantial delay. Before the actual rendering begins the entire mesh is calculated. This means that for every vertex in the mesh the trap shape calculation is carried out for every iteration at the vertex location. If a trap texture is also used, there will be additional calculations at each vertex point. This applies to any other plugins used in this section. One of this author's favorite textures is the Monnier's S.F.B.M. 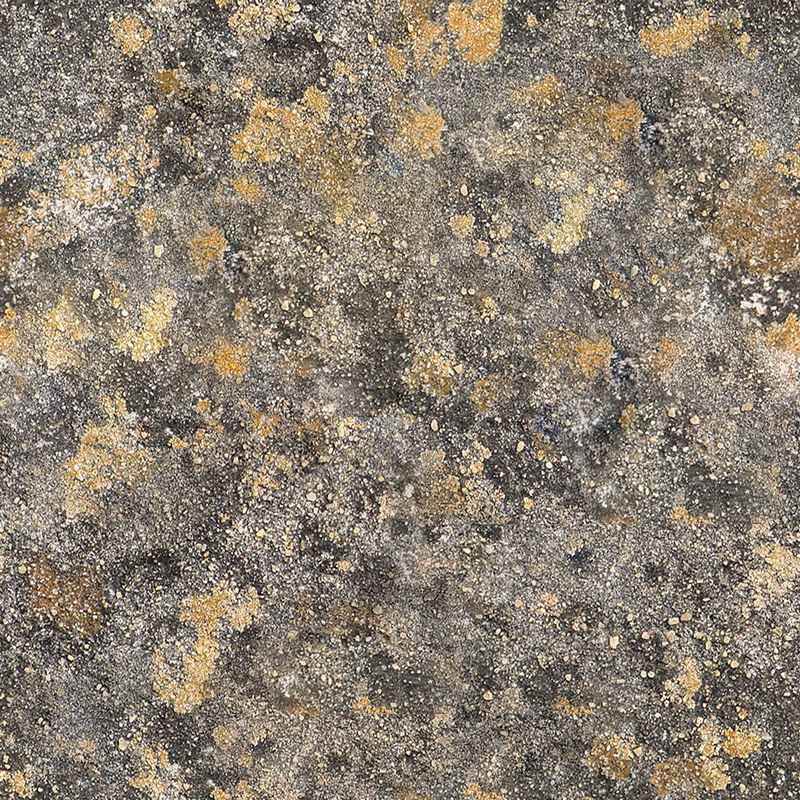 II Texture which also has a convolution option. The convolution option triples the number of times the texture is calculated at a given vertex. As you have already seen the earlier part of this tutorial textures can also be applied to the overall mesh. So why use the orbit trap texture? In the fBm example above, the texture is actually painted on top of the mesh by perturbing a Phong parameter. The Phong parameter has the same granularity as the viewing screen, e.g., a pixel so a smooth texture results. This texture simulates 3D but is not actually 3D, that is, the surface shape is not not actually perturbed and the lighting effects, including shadows, basically ignore the texture. The orbit traps texture has a granularity that is the same as the mesh, and is a true 3D texture in that it actually peturbs the shape of the surface. The perturbed surface will show all the normal lighting effects including specular lighting, light position, and shadows. The disadvantages are that it is usually much slower to render, and the amount of detail has a granularity the same as the mesh. 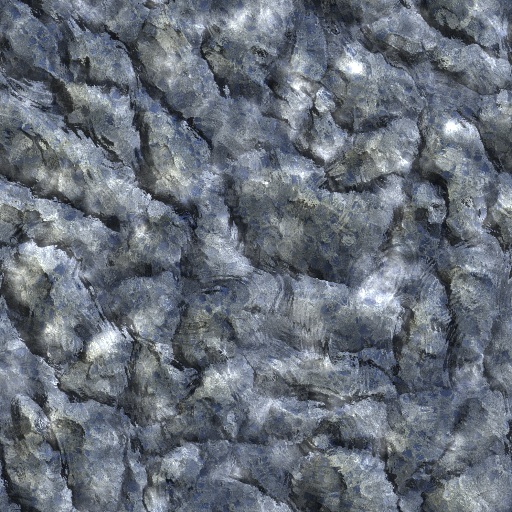 If a texture has a lot of fine detail, the detail will be lost unless the density parameter is increased. 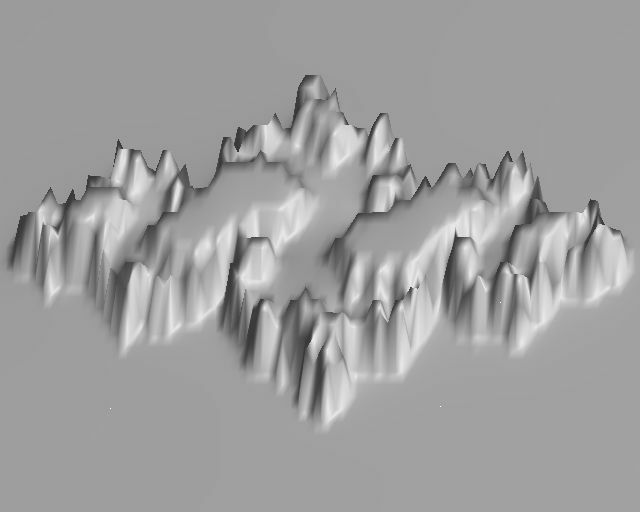 The maximum value for the density is 1.0, a setting that gives the mesh the same granularity as the screen. This will, however, dramatically increase the rendering time. The following upr and image use the Monnier texture in the convolution mode. 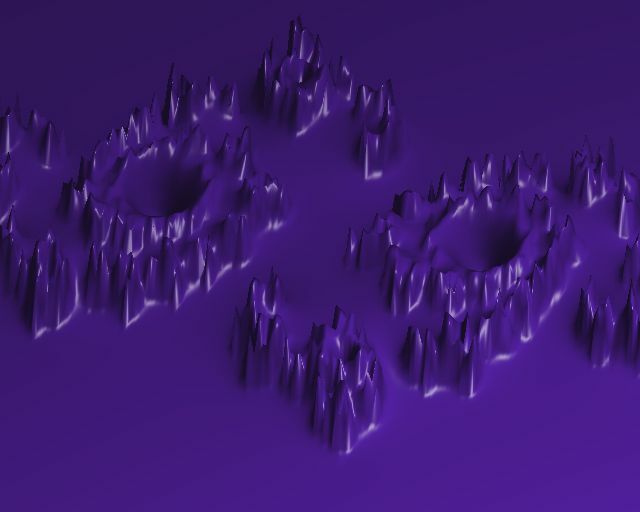 Average blur: This filter takes the average of all mesh points within the 3 x 3 matrix. Average blur gives the heaviest smoothing. Reduced Gaussian: This filter reduces the Gaussian coefficients on the points surrounding the central point. 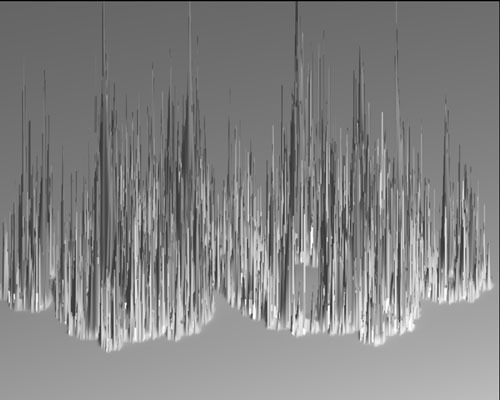 The smoothing is not as great as for Gaussian. 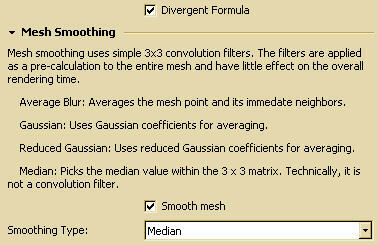 The median filter uses the same 3 x 3 matrix, but no averaging is carried out. Instead the points are sorted and the point with the median value is used. The following uprs and images show the before and after of application of a smoothing filter, in this case the median filter. Most of the height types create a very "spiky" appearance because they are based upon some version of the iteration value, or in the case of the cabs(z) method, upon the absolute value of z. As a result there is the need for various types of smoothing techniques to produce a more artistic appearance. Two height types which naturally produce a more artistic appearance are Distance Estimate and Potential. 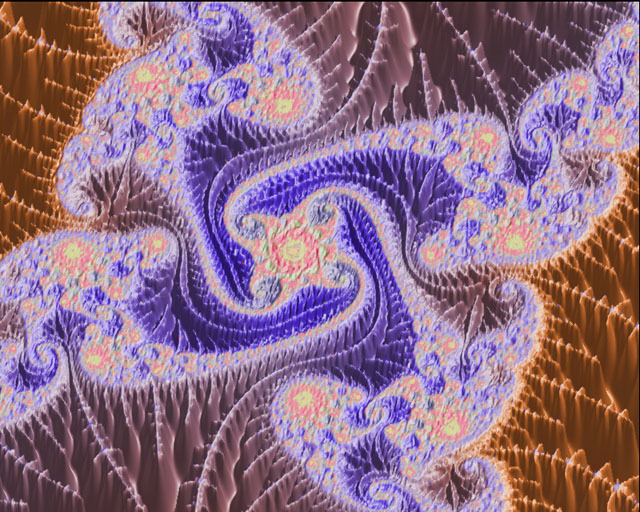 The height values based upon the potential or the estimated distance from the fractal boundary. The uprs and images below illustrate their use. 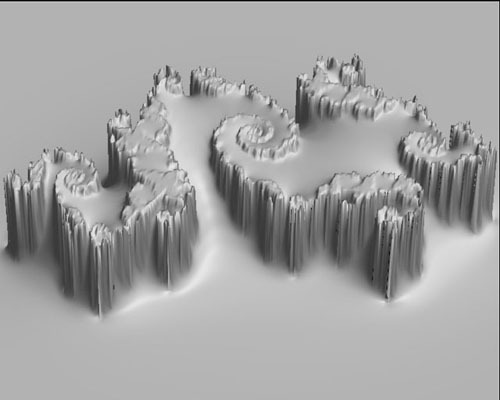 The fractal is the same as the one used in the mesh smoothing examples above. The shadows option will slow down rendering because each intersection point with a camera ray must be checked against rays from the light source to determine if the intersection point is in shadow. The extra time is often worth the effort as some really interesting results can be obtained. The next upr will combine shadows, transparency and textures along with a couple of layers that use image import. Transparency effects depend upon the unrotated height value, and works by making small height values transparent or partially transparent. The resulting layer can be used as a mask or as a filter to an underlying layer. After the upr is loaded, click the arrow next to Illumination model to see the paramter settings for shadows and transparency. Check the paramters on the top two layers. Two images are used for the upr. 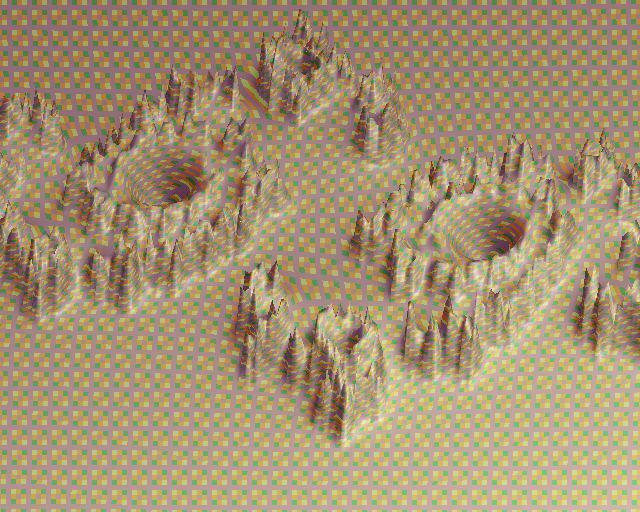 Copy the images into the Ultrafractal Images folder so that Ultrafractal can find them. 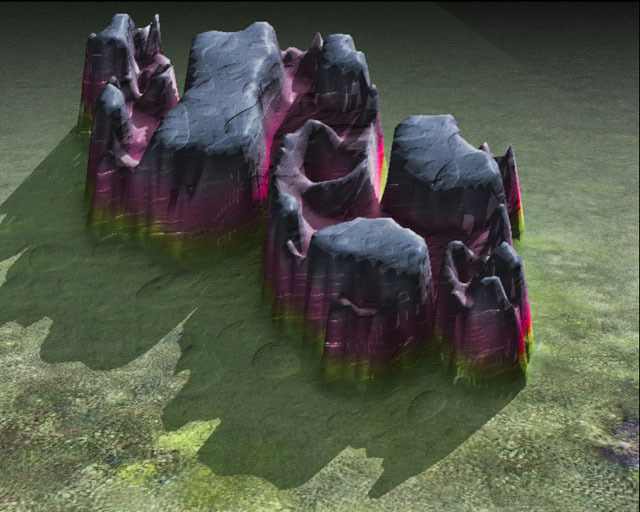 The top layer, which is the diffuse lighting layer, has a Monnier texture applied that creates the melted blob structures. The artist might want to look at the two layers that use the images (layers 5 and 2), as the images have convolution filters applied to them, along with some color changes, to totally change the way they appear. The image import uses the Exponential Smoothing ucl and the Convolution Color Wrapper plugged into the Colors slot. In both the convolution filter is Painter's Toolbox which uses and algorithm that was also used in the move Shrek. The next upr uses transparency but no shadows. The top layer uses distance coloring and has a Convolution Color Wrapper plugin with a Monnier texture. The next layer uses diffuse lighting and and has the same Monnier texture as a direct texture plugin. The artist should look at both of these layers and see how they are configured. The final upr for the mesh raytracer illustrates that it can be used for high detail, moderately deep zoom heightfields. In this case the zoom is 2e9. It is not recommended for this use as it is slow and the images cannot be very large because of memory considerations. 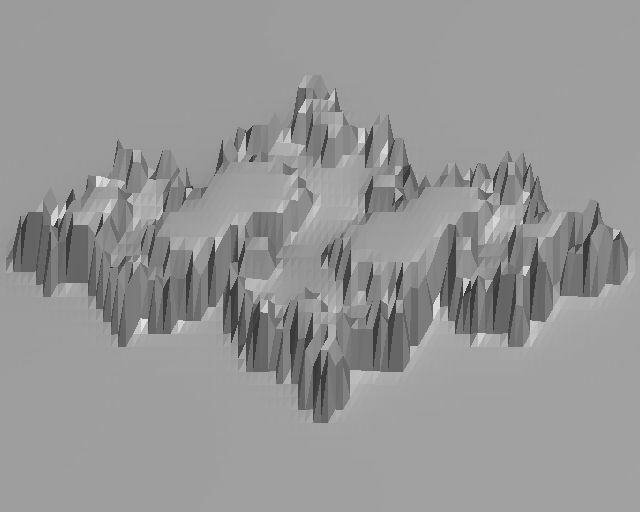 Instead, use the 3D Heightfield Raytracer.